For those of us who live in the swatch of U.S. states located within the dreaded “Tornado Alley,” we are accustomed to the routine issuance of Tornado Watches by our local weather stations beginning in the Spring and lasting into summer. The issuing of a Tornado Warning is rarer but still common, yet many people, even those who have lived their whole lives in Tornado Alley find themselves doing the wrong thing when the sirens go off. Running outside to “spot” it or trying film it on their phones for posterities sake are a couple examples. You know you’re guilty of this. Most of us Midwesterners are. The U.S. experiences an average of 1,200 tornadoes each year. Tornadoes can occur and have occurred in every state with the majority hitting Texas, Florida, Oklahoma, Missouri, Kansas, Alabama and Mississippi. 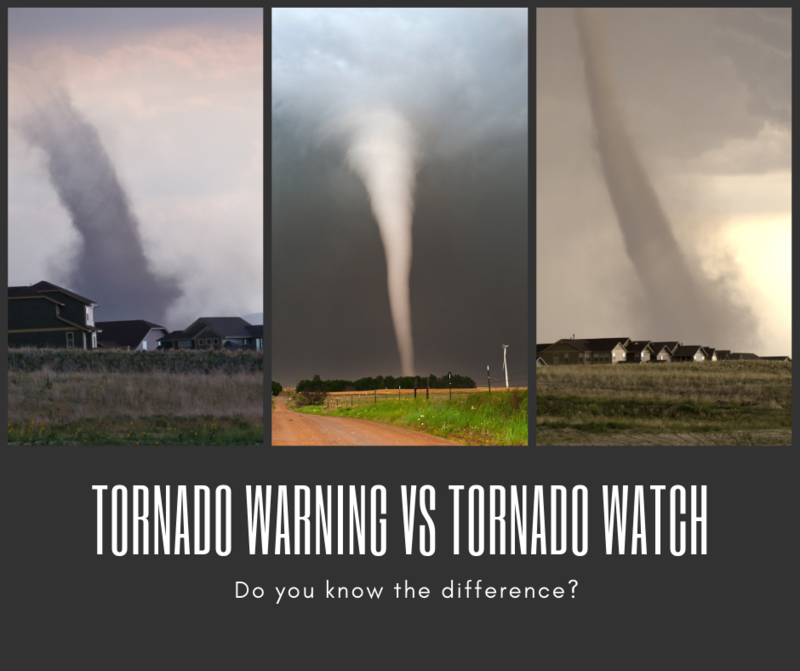 Since so many people live in tornado prone states, the question begs to be asked, do we really understand what initiates a watch vs a warning and what actions should we then take to ensure our safety? As we have already seen earlier this year tornadoes are violent, unpredictable and sometimes deadly forces of nature. Having a clear plan of action in place when tornado watches and warnings are issued can be the difference between life and death. What is a Tornado Watch? Atmospheric conditions in your area are suitable for a tornado. What does this mean? Basically, tornadoes rotate out of thunderstorms and thunderstorms form as a result of unstable atmosphere conditions created by warm, humid air from the South becoming trapped under cooler, dryer atmospheric air from the North. When a tornado watch has been issued for your area, don’t ignore it! This is a great time to review the location of the tornado shelter nearest you. You should also gather emergency supplies such as a radio and flashlight, so they are easily assessable in the event power goes out. Keep an eye on changes in the weather and stay tuned to your local broadcast. Tornado watch areas usually encompass entire counties or even states. What is a Tornado Warning? A tornado has been detected by radar or sighted by a human spotter in your area. Take shelter immediately and follow your tornado safety plan. DO NOT GO OUTSIDE. Most injuries and deaths from tornadoes are caused by flying debris. If inside a building or house head to the basement or the lowest level and take shelter in the most interior room. You want as many walls as you can get between you and the tornado. If you are in a vehicle, do not try to outrun the tornado. Get into a ditch or low-lying area. Same goes if you are in a mobile home. As we tragically saw in Alabama earlier this month, mobile homes do not fair well in tornadoes and can become death traps. Follow your Tornado Safety Plan. Don’t have one? Create one today.